I know that I’ve gone on about this five year journal loads, but I just want to say one more thing before I shut up about it forever: it is so brilliant! For those who have missed my past raves and know nothing about it, each page inside the journal has the date and a question, and you answer that same question for five years in a row. So 365 pages, 365 questions and five gaps on each page so that as the years go by, you gradually fill up all of the space. What I love so much about it, now that I am into the second year, is that you can look back and see exactly what you wrote the year before, and sometimes it’s quite eye-opening to see how much you’ve changed in such a short space of time. The questions are sometimes rather profound, sometimes silly, but I suppose it’s all in the way you answer them. At any rate, you only get a few lines to write on so it’s not as though you can go into any great detail. But it’s an interesting exercise, trying to condense your thoughts and feelings into such a small amount of space and perfect for those who hate the idea of writing a proper, lengthy journal. It’s like a little snapshot into your mind and life at that particular moment. 8th January: What song is stuck in your head? 2014: Right now, but it’s only just popped in, it’s The Sound of Silence. I am singing it to the cat, but have changed words to Hello Monkey my old friend, you’ll be there until the end. 2015: The jolly roger tune that they play about sailors and pirates. [Mr AMR] has just told me it’s called Captain Pugwash. Not all of my answers are silly, but I like that the questions posed are quite flexible and so your answers reflect your mood and state of mind. I’d reveal a more serious post, but it’s “Blue Monday” today and I don’t want to put anyone on a downer! Anyway, enough – that’s the last I’ll say upon the matter, it just occurred to me that if I was going to write about the journal then it should be before the end of January, because then you would still have time to catch up without too much trouble. 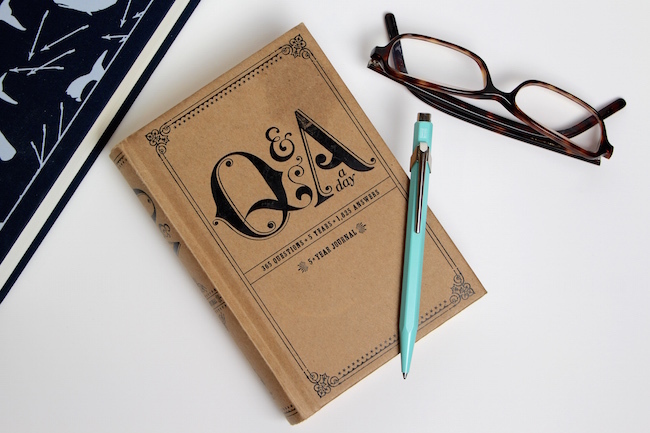 You can find the Q&A journal online for about a tenner (see here). Next Post Family Get-Togethers + Luxury Houses = Perfect Stays.